The following are the latest results contributed by HM Courts Service, for cases sentenced by West Sussex Magistrates’ Court sitting at Worthing from February 5 to 9, 2018. Arron Cotton, 29, of Langrune Close, Chichester, was given a community order with Rehabilitation Activity Requirement after admitting criminal damage, causing approximately £1,000 damage to items including walls and a highchair, in Chichester on November 26, 2017; and possessing cocaine in Fishbourne on November 26, 2017. He was also given a restraining order and must pay £1,010 compensation. He was fined £369 and must pay £85 compensation, £85 victim surcharge, £85 costs, after admitting assault by beating in Chichester on November 26, 2017. Lewis Moore, 24, of Servite Close, Bognor Regis, was given a community order with Rehabilitation Activity Requirement and must pay a total of £152.50 compensation after admitting stealing alcohol worth £2.50 from The Co-op, Hawthorn Road, Bognor Regis, on February 20, 2017; destroying a window and sign at The Co-op, Hawthorn Road, Bognor Regis, on February 21, 2017; assaulting a police constable in the execution of his duty in Bognor Regis on February 21, 2017; resisting a police constable in the execution of her duty in Bognor Regis on February 21, 2017; and failing to surrender to custody at Worthing Magistrates’ Court on March 28, 2017. He must also pay £85 victim surcharge, £250 costs. Gemma Murphy, 34, of Oakbury Road, Fulham, was given a community order with Rehabilitation Activity Requirement and fined £120 after admitting interfering with a motor vehicle with intent to steal the vehicle, or part of it, or anything carried in or on it, in Bognor Regis on October 15, 2017. She must pay £85 victim surcharge, £85 costs. Amanda Robinson, 46, of Gordon Avenue, Bognor Regis, was given a 26-week prison sentence, suspended for 24 months, with Alcohol Treatment Requirement and Rehabilitation Activity Requirement after admitting stealing £12,522.56 from Siga Creative, Bognor Regis, between March 11, 2015, and January 12, 2017. She was given a 26-week consecutive prison sentence, suspended for 24 months, after admitting falsifying a record by making a computer entry for accounting purposes showing a payment to a supplier, when in fact the payment was made to an account in her name. She must pay £12,522.56 compensation, £115 victim surcharge, £85 costs. Archie Awcock, 21, of Glynde Crescent, Bognor Regis, was fined £325 and must pay £32 victim surcharge, £85 costs, after admitting drug-driving (540mg cocaine per litre of blood) in Hotham Way, Bognor Regis, on October 14, 2017. He also admitted drug-driving (>800mg benzoylecgonine per litre of blood) in Hotham Way, Bognor Regis, on October 14, 2017, no separate penalty. He was disqualified from driving for 12 months. James Dixon, 38, of Perack Court, Elmbridge Avenue, Surbiton, was fined £400 and must pay £40 victim surcharge, £85 costs, after admitting possessing 0.25g of cocaine in Selsey on August 26, 2017. He also admitted possessing 2g of cannabis in Selsey on August 26, 2017, no separate penalty. Alice North, 20, of Radnor Road, Worthing, was committed to detention for 12 weeks, suspended for 12 months, with Rehabilitation Activity Requirement after admitting stealing clothing worth £210 from Topshop, Chichester, on September 26, 2017. She must pay £115 victim surcharge, £85 costs. She was given two 12-week concurrent sentences, suspended for 12 months, after admitting stealing clothing worth £615 from New Look, Chichester, on September 26, 2017; and stealing baby accessories worth £107.97 from Morrisons, Littlehampton, on September 26, 2017. Daniel Glen, 37, of Noahs Ark Inn, Lurgashall, was fined £377 and must pay £37 victim surcharge, £85 costs, after admitting drink-driving (74mg of alcohol in 100ml of breath) in High Hampstead Lane, Lurgashall, on January 22, 2018. He was disqualified from driving for 18 months. Gareth Hemingway, 37, of Horsefield Road, Selsey, was fined £339 and must pay £33 victim surcharge, £85 costs, after admitting drink-driving (69mg of alcohol in 100ml of breath) on the A286 Singleton on January 22, 2018. He was disqualified from driving for 20 months. Fiona Stradling, 52, of Nursery Gardens, Chichester, was fined £120 and must pay £30 victim surcharge, £85 costs, after admitting drink-driving (88mg of alcohol in 100ml of breath) on the A27 Lancing on January 21, 2018. She was disqualified from driving for 20 months. 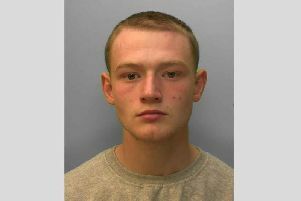 Harry Warden, 31, of Charles Avenue, Chichester, was given a community order with three-month curfew, electonically monitored, from 7pm to 7am daily, a Thinking Skills Programme Requirement and Rehabilitation Activity Requirement after admitting using threatening words or behaviour with intent to cause harassment, alarm or distress at St Richard’s Hospital, Chichester, on January 6, 2018. He must pay £100 compensation, £85 victim surcharge, £85 costs. He was also fined £100 and must pay £200 compensation after admitting causing £2,000 damage to a van in Chichester on October 25, 2017. Omer Celik, 41, of Woodlands Lane, Chichester, was fined £750 and must pay £75 victim surcharge, £350 costs, after being found guilty of failing to identify a driver when required by police in Shoreham on May 30, 2017. He was disqualified from driving for six months.